A dead man walks into a police station. He tells a tale – bizarre as it is grotesque – of kidnap and organ harvesting. John Baden’s story of being held prisoner for twelve years sounds far-fetched – but it’s all about to get much, much stranger. DI Ben Westphall has been given the case because of his background in MI6. He also has a knack for getting inside people’s heads and seeing things others would miss. Westphall is no ordinary detective and this is no ordinary investigation. I hadn’t heard of this author before receiving this intriguing book but having looked into it he has released quite a few popular books as part of a sort of darkly comedic series. 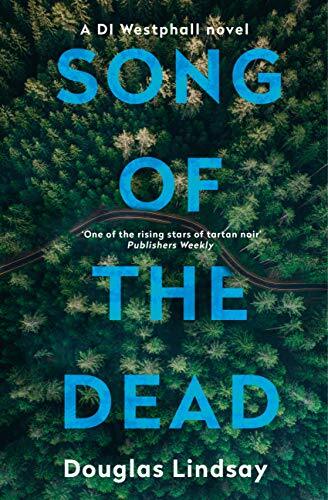 Song of the Dead seems to be a bit different to his usual type of book being much more of a gritty thriller than a comedy. The book introduces us to DI Ben Westphall who is enlisted to look into a particularly peculiar and grisly crime. First of all I liked the Scottish aspects of this book a lot. Being a Scot myself I recognised a lot of the less well known parts of my beautiful country and I always enjoy recognising places I know whilst reading and also feeling like the author has been there too. Part of the book is also set in Estonia which I must say is a country I don’t think I’ve ever come across in a crime series so I found the descriptions of the place and climate really interesting. The setting was skilfully dealt with throughout the whole book with great use of language and imagery. The author’s writing style is really quite unusual and I’ll admit it took me a while to get used to. I imagine it’s a style typical of this writer. It is very direct and immediate, almost like a telegram or report in the way it narrates the facts and action. I always find first person narrative takes me a little while to appreciate but once used to it, I actually enjoy it. Whilst the writing is quite direct there is often a slightly melancholic feeling of sadness running through it which gave the whole book a real atmosphere. The main character also has that sort of sense of sadness and sensitivity to him which made him an intriguing character to follow. Overall I very much enjoyed this start to a new crime series. The main mystery is not one I’ve come across in crime fiction before which is impressive as it is such a popular genre that things can start to feel overdone. The plot moves at a good pace and contained enough surprises to keep me interested. I would definitely pick up the next book in the series. I received a copy of this book from the publisher. My review is my own honest opinion. Sounds like a great read! Will check it out 😊 great review!